West Virginia Thunder 2021 bests FBC Mo YoungGunZ to take the 8th Grade Division and make it three Showdown titles for Thunder! In the fourth and final part of our Midwest Showdown coverage, the 36-team 8th Grade Division is reviewed. West Virginia Thunder 2021 defeated FBC Mo YoungunZ 56-44. By winning this title, Thunder completed a sweep of the three lower age group divisions. Clap your hands for the Thunder! 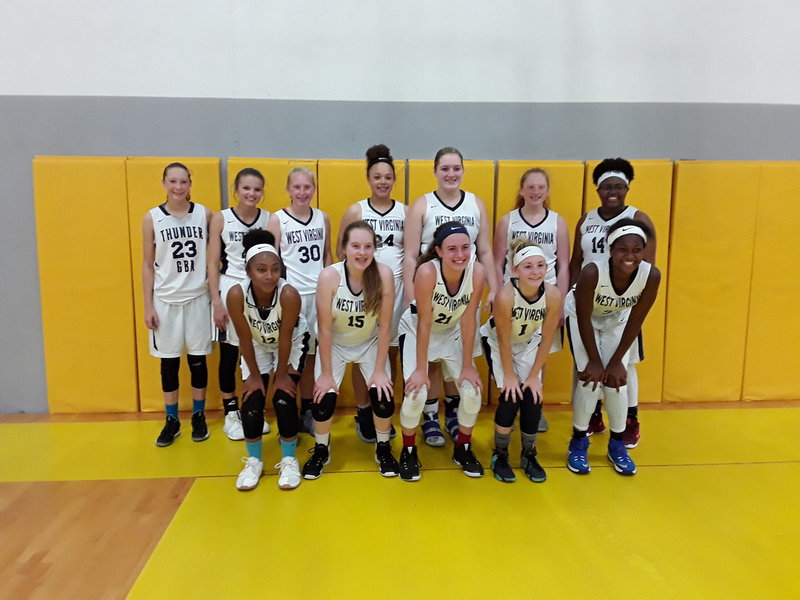 A total of 106 teams participated in the 8th, 9th and 10th Grade Divisions of the 2017 Midwest Showdown and teams representing the West Virginia Thunder club won all of them. Look at the home towns of the various division all-tournament team members and you will see this event drew teams from places as distant as Alabama, Georgia, Missouri, Illinois and Pennsylvania. If you were developing a list of future college prospects, the players from West Virginia probably would not top the list while still being on it. What they did however show was that well-coached, competitive basketball players willing to buy into the system and play together could defeat superior individual talent on a big stage. Winning any one division is a tremendous accomplishment but to win three in the same year is something very special. Congratulations to Scott Johnson (who runs the Thunder program), his coaches and of course the players for completing this amazing feat! It should be mentioned that FBC (stands for Finast Basketball Club – out of Metro Atlanta) also placed two other teams into the Platinum 8th Grade Bracket (all first place teams from pool play) of this division in addition to making the 9th Grade Platinum Bracket Final. Bravo to these quality accomplishments! This contest pitted the GunZ group of young, talented athletes versus the team-oriented Thunder. The Thunder coaches must have scouted the Gunz (missing its best perimeter shooter) and slapped a zone defense on the team out of the Atlanta area. The Gunz struggled to post points for much of the game. The tone was set from the outset as Thunder wing players Baylee Goins (see A-T list) and Grace Hutson (5-7, 2021) hit several threes in the first half leading Thunder with nine and eight points respectively. Meanwhile, the GunZ struggled to score over the zone trailing 19-10 at the quarter and 30-17 at half with no player over four point to the break. In watching the game, you kept thinking that the GunZ athletic pressure would trigger a big run but it never happened. Here is where Finals Game and 8th Grade Division MVP Skylar Davidson needs to be mentioned. This point guard (and coach’s daughter) made certain to limit Thunder turnovers and either scored herself (nine for the game) or helped set up a teammate to nip a GunZ’s scoring runs before more than a couple of baskets got strung together. This also typified her play over the weekend. The lead never got much closer than ten points in the fourth quarter. With balanced scoring, West Virginia was led for the game by Grace Hutson with 10 points. FBC was led by Mia Moore (5-5, 2021) with 13 points. With the All-tournament selections below and in parts 1-3, an attempt was made to give credit to something that was accomplished now. In this sport, there is a lot of “playing for tomorrow” in trying to get better (nothing wrong with this!) to achieve future success be it a college scholarship or perhaps a successful high school season. On occasion we need to stop and salute those who got something done today regardless of whether or not they turn into the stars of tomorrow.